DOVER AIR FORCE BASE, Del. -- General Ronald R. Fogleman, Air Force chief of staff, did not make a statement during the June 27, 1996, arrival of the airmen killed in Saudi Arabia. Instead, he pinned a Purple Heart on each of the 19 Stars and Stripes-draped caskets. After a final salute to the men he once commanded, he slowly marched back to his seat and sat down next to his wife, Miss Jane. The Air Force chief of staff looked tired -- like he was carrying the weight of the entire Air Force on his shoulders. The airmen were killed June 25 when a gasoline truck exploded outside the Khobar Towers housing area on King Abdul Aziz Air Base in Saudi Arabia where they lived. President Clinton called the attack "a murderous act which must not go unpunished." Three hundred people were injured in the blast. Of those, 64 were hospitalized, one in serious condition. Air Force Secretary Sheila E. Widnall and Gen. John M. Shalikashvili, chairman of the Joint Chiefs of Staff, as well as family members of the deceased, were on the base flightline to welcome the airmen home. About 700 base members were also there to pay their respects to their fallen comrades. The remains were brought to Dover by a C-5 Galaxy, after a 15-hour flight from Dhahran, Saudi Arabia. The massive transport came to a stop at high noon -- under a bright sun tempered by a cool breeze -- and opened its forward ramp. After a 21-gun salute from the Air Force Honor Guard, the guard carried the aluminum caskets to the waiting hearses. Widnall said that after the tragic events at Dhahran had unfolded, she wondered "what possibly could ease the pain and sorrow of the family and friends left behind. "I only hope a deeper understanding of what each member's service meant to the nation may offer some solace," she said. "All 19 victims knew the dangers of military operations. All had served beneath the American flag and had made personal sacrifices for the good of the nation." The secretary said all the airmen had one goal, "a stable world where freedom can flourish." "This is a painful reminder of the dangerous world in which we live," she said. It is the spirit and dedication of the nation's servicemembers that allows the United States to continue extending a "helping hand and heart" across the globe, Widnall said. "That spirit was exemplified in the individuals we honor today as well as the many others who were wounded in this terrible act. "Defenders, peacemakers, peacekeepers, humanitarians -- there is no more meaningful work," Widnall said. "Today we remember their accomplishments, praise their dedication to higher goals and honor their memory." Shalikashvili said Americans had the solemn duty of welcoming home "airmen who were victims of a vicious act of terrorism. "Just a few weeks ago, on a visit to Saudi Arabia, I met with some of these same airmen. They were proud professionals, ambassadors of peace, serving their country far from home under difficult -- and they knew sometimes dangerous -- conditions," Shalikashvili said. "I saw on their young faces that they had so much to offer and so much more of their lives to live, " Shalikashvili said. The chairman said the airmen represented the finest America had to offer and their loss left a "shocked nation, mournful friends and a grieving family." "We are terribly saddened," he said. "Our sympathy goes out to the many other airmen injured in the bombing. But our hearts, especially, go out to the spouses, the children, the parents of the 19 airmen who returned today," he said. Airman Wilfredo Urbina sat on the bleachers a long time after the event ended and those in attendance had left. The medical technician with the 436th Medical Group said though he has been to these kind of events at Dover before, "nobody ever really gets used to them." "This kind of loss has a major impact on all of us -- it's like losing a member of your family," Urbina said. "We lost some good people, and though we can't forget that, it's something we have to put behind us and get back to business as usual. "If given the opportunity, I'd take the place of any one of those airmen we lost at Dhahran," he said. The names of the remaining airmen killed in the explosion were read before their posthumous medals were presented. Of those, Staff Sgt. Daniel B. Cafourek, Watertown, S.D., and Senior Airman Earl R. Cartrette Jr., Sellersburg, Ind. ; both of the 33rd Fighter Wing, Eglin Air Force Base, Fla., have been positively identified. -- Staff Sgt. Ronald L. King, 55th Contracting Squadron, Offutt AFB, Neb. -- Senior Airman Paul A. Blais, 71st Rescue Squadron, Patrick AFB, Fla.
Shalikashvili said the loss of the airmen must serve as an example to other servicemembers. "We must rededicate ourselves to their unfinished work and we must take courage from their sacrifice and from their service. "We will not stop until the criminals responsible for this act of terror are brought to justice," he said. 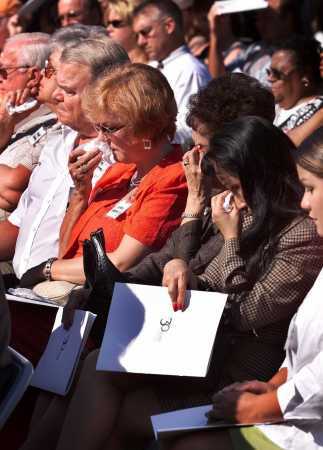 The parents of Brian W. McVeigh, Sandra and James Wetmore, fourth left and third left respectively, and other family members of the Khobar Towers bombing, take part in a ceremony at Arlington National Cemetery in Arlington, Va., Monday, June 25, 2001, marking the fifth anniversary of the bombing. 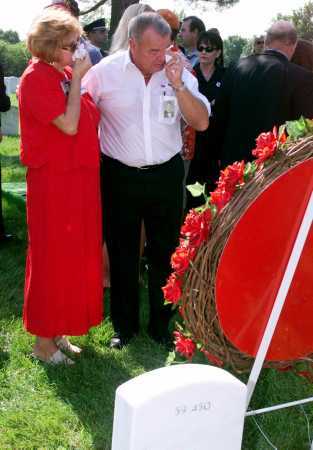 Sandra and James Wetmore, pause at the grave of their son Brian W. McVeigh at Arlington National Cemetery in Arlington, Va., Monday, June 25, 2001, during a five year anniversary ceremony honoring those who died in the Khobar Towers bombing. The truck bomb explosion at the high-rise apartment building where U.S. Air Force members were housed in Dhahran, Saudi Arabia, killed 19 American airmen in 1996. The ceremony was sponsored by No Greater Love. 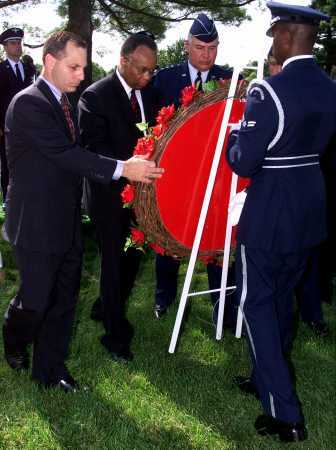 Outgoing FBI Director Louis Freeh, left, Deputy Attorney General Larry Thompson, center, and Air Force Lt. Gen. Charles F. Wald place a wreath at the graves of two victims of the Khobar Towers bombing during a ceremony at Arlington National Cemetery in Arlington, Va., Monday, June 25, 2001, marking the fifth anniversary of the bombing. The truck bomb explosion at the high-rise apartment building where U.S. Air Force members were housed in Dhahran, Saudi Arabia, killed 19 American airmen in 1996. The ceremony was sponsored by No Greater Love.